The Greatest Threat to Your Horsemanship? / The Greatest Threat to Your Horsemanship? 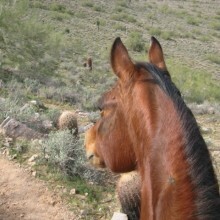 Ahhh… a lovely gallop in the desert. Your horse is relaxed and soft as she moves deftly along the trail easily bending left and right around the shrubbery and cactus. Her head is at a great angle, not too high, not too low as she navigates… bridle-less. Perhaps a dressage horse with a delicate canter pirouette without a trace of a brace. Maybe a western pleasure horse that actually looks like it’s having a good time. But this isn’t what many, if not most people, are getting when they go out to ride their horse. Why not? You’re looking forward to riding your horse, you grab your halter and lead then head to the corral. Your horse sees you coming and heads for the far corner. As you approach, your precious angel swishes his tail and maybe casually lifts a hind leg giving it a bit of a shake at you. Ugh. You grab her anyway. While you’re tightening the saddle girth/cinch, your ‘Precious’ keeps swinging his head around with his ears pinned and teeth showing. As you ride around the arena, ‘Darling’ jumps four feet sideways, spins and bolts as a grocery bag tumbles like a weed just outside the fencing and suddenly you’re half way back to the barn. You jump off and decide to lead Precious to settle him down and since he’s being fractious you ‘let’ him circle around and around you as he keeps getting ahead of you. While these may seems like a lot of different things and of course we could name a lot more, they really are the same set of issues. What would compel you to exchange what you have for what you dream of in your mind? How hard would you have to look at yourself in order to make the necessary changes? Or do you think you’re progressing at a rate that will get you your dreams before you die? Many folks in every different discipline are still approaching horsemanship the way some have been doing it for hundreds of years. But, there’s just so much out there now that shows that many of these techniques and results are NOT the best ways and some of them are downright barbaric. In my decades of teaching I’ve changed enormously from my formal hunter/jumper/dressage training of my younger days. And I continue to change as I see how the horse responds. What I’ve come to find with my students is a surprise to me. I explain how a horse might be thinking about a request or demand and why or why not the horse may choose to comply or not. Then discuss how the student might approach the task. Basically, I gave the student an explanation of the horse’s possible outlook. Over the years, though, I find that people understand much easier if I can attach it to a human condition or occurrence not the horse’s. Let’s work on the assumption that misunderstanding is the root of the problem. Agreed? Now, if I may be so bold, I’d say that’s the biggest problem on earth. Wives and husbands, mothers and kids, boyfriend and girlfriend, political parties, countries, religions, medicine/health. I could go on and this paragraph would be huger (that’s huge-er) than really big things if I expanded or felt the need to explain the various ways misunderstandings crop up. But, it seems to me that we’re so busy trying to MAKE our horses do things with myriad means from equipment to stabling to tasks and such we don’t take a moment to notice if our horse understands what we want or if he just has to go along in a fog because we have caused him to. 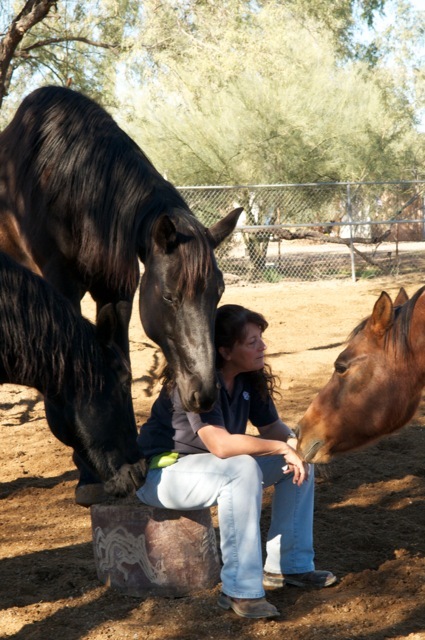 We’re willing to exchange a horse’s pain thru physics and manipulation for understanding if it gets us what we want. And we want it RIGHT NOW!